1.e4 e6 2.d4 d5 3.¤c3 ¤f6 4.Ґg5 Ґb4 5.e5 h6 6.Ґe3 ¤e4 7.Јg4 g5 8.h4 h5 9.Јd1. It is possible to sacrifice a queen but the problem is that this sacrifice leads only to a draw: 9.hxg5 hxg4 10.¦xh8+ Ґf8 11.¤xe4 dxe4 12.¤e2 c5 13.0–0–0 Јa5 14.¤c3 cxd4 15.Ґxd4 ¤c6 16.¤xe4 ¤xd4 1/2 Shirov – Volkov, 2003 (16...¤xd4 17.¤f6+ ўe7 18.¦xd4 Јe1+ 19.¦d1 Јxe5 20.¤g8+ ўe8 21.¤f6+ ўe7=). It seemed to me that Black stands slightly better. 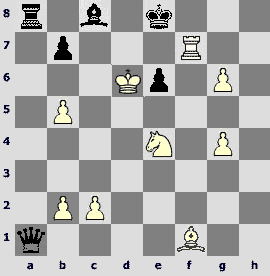 White`s center falls apart and there is no play either on kingside or on dark squares. 12...¤xc3 13.Ґxg5 ¤xd1 14.Ґxd8 ўxd8 (14...¤xf2 15.Ґf6 ¤xh1 16.Ґxh8 d3 17.cxd3 ¤xb4 18.ўd2І) 15.¦xd1 ¤xe5 16.¤xd4І; 12...dxc3 13.¤xc3 ¤xc3 14.bxc3 gxh4 15.f4І. 13.¤xe4. An unclear opening position rapidly turns to an endgame. Weakness of the Black`s dark squares compensates weakness of the White`s pawns. 13...dxe4 14.Јxd8+ ўxd8 15.hxg5. White`s pawns are under attack. Black chooses which of them he would like to take. It is worse to play 15.fxe3 g4! 16.¤g3 ¤xe5 17.¤xe4 ўe7і. 19...¤f5+? 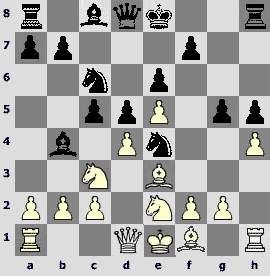 Skorchenko didn`t notice that his opponent`s king moved to the center. It is better to choose 19...¤xc2 20.¦xe4 a5 21.bxa5 ¦xa5 22.Ґd3 ¦xg5+ 23.ўf3 ¦hg8 24.Ґxc2 ¦g3+©. 20.ўf4 ¤d6 (20...e3 21.Ґd3 a5 22.b5±) 21.g4 h4 22.¦d1 ўe7 23.ўe5. 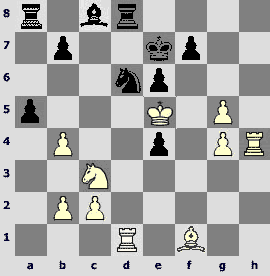 White completely dominates and Black doesn`t have any counterplay in spite of the two passed pawns. 23...¦d8. Perhaps it is better to go for 23...¤e8 24.¤xe4 Ґd7 25.b5±, but this variation also gives White an advantage. Black`s last chance consists in the advance of the a-pawn. Skorchenko achieved his object and the a-pawn turned into a queen on a1. However, it didn`t save him. 25.b5 a4 26.¦h7 a3 27.g6. White doesn`t pay attention to the pawn advance! Checkmate is my main goal! 27...¤c4+ 28.Ґxc4 ¦xd1 29.¦xf7+ ўe8 30.¤xd1ќ; 27...axb2 28.¦xd6 ¦xd6 29.¦xf7+ ўe8 30.ўxd6 ¦a3 31.¤xe4 ¦f3 32.¦xf3 b1Ј 33.g7 Јb4+ 34.ўe5. 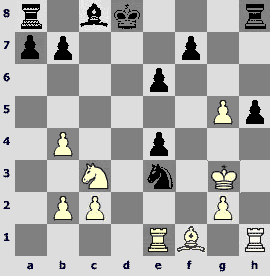 All White`s pieces except the g4-pawn are necessary for the victory in this position. This game shows that king is a strong piece in the endgame indeed.